Alee ibn Ibraheem, from his father, from Hannan ibn Sudir and Muhammad ibn Yahya, from Ahmad ibn Muhammad ibn Isma'il, from Hannan ibn Sudir from his father who said: I asked Aboo Ja'far (a.s) about them both (i.e Aboo Bakr and Umar), so he (a.s) said: "Aba Al-Fadhal do not ask me about those two (Aboo Bakr and Umar) because by Allah (swt) none of us ever dies without being discontented with them, and till this day there is none among us but that he is discontented with them. The elders among us bequeaths this (i.e. about discontentment with those two) to the young ones. 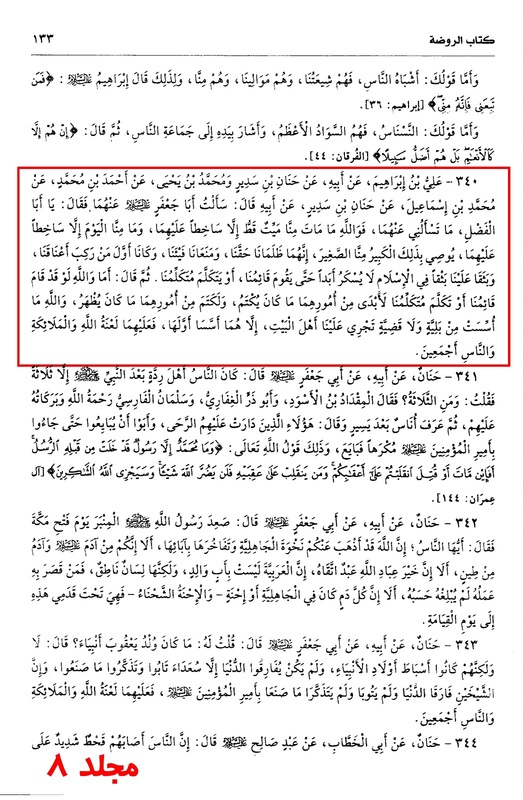 Verily they suppressed our right and prohibited us from it, and they were the first to mount our necks and transgress upon us, transgression in Islam will now never stop until our Qa'im (Mahdi) rises or our speaker speaks." He (a.s) then said: "But by Allah (swt)! If our Qa'im (the one who raises) rose and our speaker spoke, their affairs which were hidden would be revealed and their issues/innovations which our apparent would be hidden (erased). By Allah (swt)! No affliction or trouble afflicts us Ahlulbayt (a.s) but that those two (Aboo Bakr and Umar) are its root cause, so upon them be la'nah (damnation) of Allah (swt), the angels and all the people. 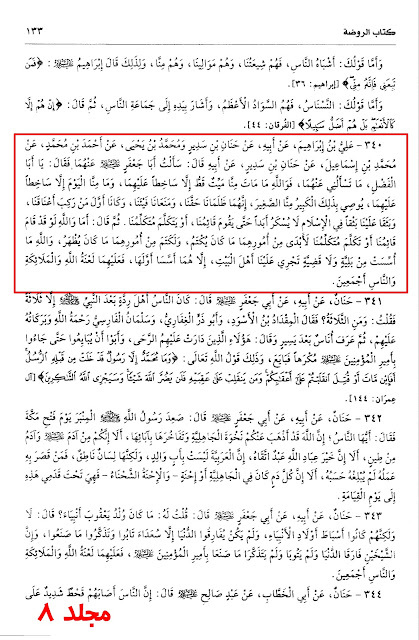 Footnote: Al-Majlisi II said this hadeeth is Muwaththaq (Reliable) in Mir'aat Al-Uqool, Vol. 26, Pg. # 212. Source: Al-Kafi. Vol. 8, Pg. # 133, H. # 340. Mashallah very good Hadith. May I request that you publish a article on muta please ?